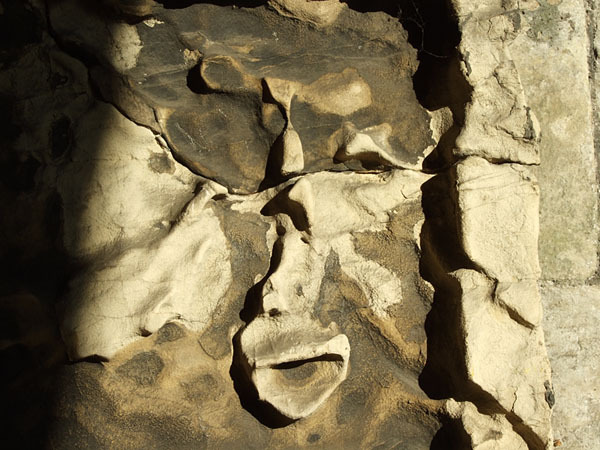 A funny face … or that’s how I saw it. Actually it’s just a worn bit of stone, which I must have passed many times, in the entrance to what we called ‘the tunnel’. Never noticed it before, and I think it’s not visible now, but was in August 2007 when I took this. It illustrates a couple of things relevant to this website. First, that walking around with a camera makes you pay attention and see things you’ve not seen before. Which is why this website began. Secondly, that the familiar things change all the time, because of the position and strength of the sunlight, in particular. So this ‘face’ came out of familiar worn stone to greet me, on a sunny day in August. Which is another thing this website perhaps reflects – the effects of the changing seasons. The effect of them is perhaps best illustrated by the low number of pages added to this website in January (2), compared with the almost daily postings now, in July. So, back to that ‘face’. Looking at it now, it looks like it’s ‘puckering up’ for a kiss. Which is rather convenient, as it leads me on to explaining the title of this page. 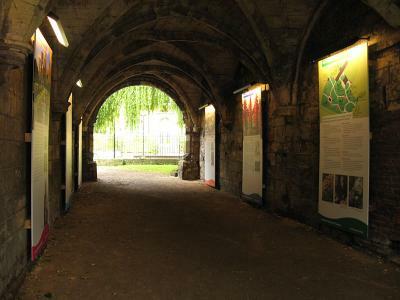 The ‘tunnel’, as we called it, is actually part of the remains of St Leonard’s hospital, just inside the entrance to the Museum Gardens – or the gardens, as we called them. We used to go to the tunnel in the gardens. We knew what we meant. Our world was small and local and focused on ourselves and we didn’t care if no one else knew what we meant. When I took these photos in 2007 the tunnel looked exactly the same as it used to, back in 1984, when I knew it well. In the springtime of 1984 I used to sit in here with my boyfriend. It was a place teenagers could meet and be near to ‘civilisation’ while also being in a kind of private space, covered over. Both open and enclosed. Kind of private, but not too far away from the reassuring safety of other people, normal adult life. Those sarcophagi (stone coffins) lining the tunnel were our seats. 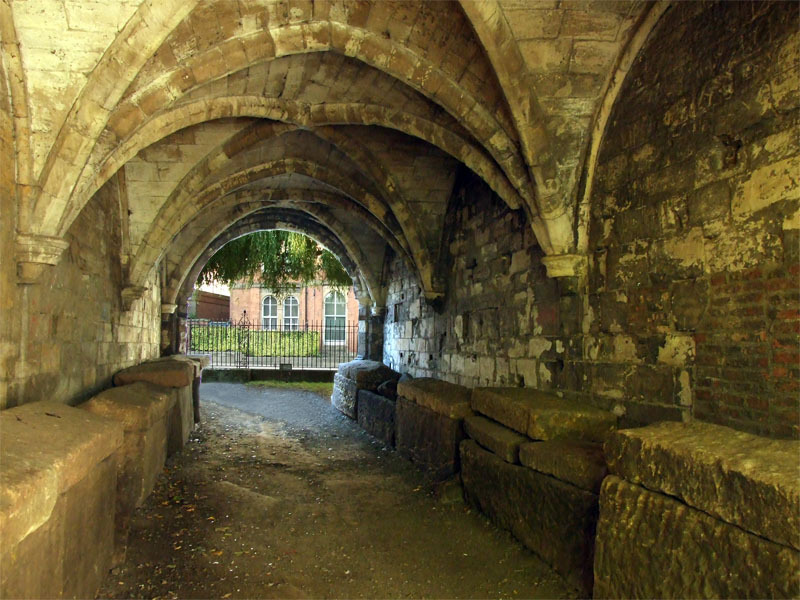 I vaguely recall having a momentary struggle over the idea of sitting on a coffin, but York is so full of remnants of past lives, and when you’re young death seems so far away that any reverence for the dead is far away too, I guess. Certainly if they’re Roman dead, which seems ridiculously remote and not relevant. And the way they were lined up in here didn’t exactly encourage a feeling of awe. It’s like they were just put here out of the way, like they were in storage. Not that I thought about it that much at all. So many ways of seeing, and it changes with age, and in 1984 I was thinking about meeting my boyfriend, doing my O’levels, and leaving home. Leaving home when you’re sixteen isn’t that usual now, and wasn’t then, and occurs because of impossible situations and unhappiness. So I think there was probably a lot of crying done here in this tunnel, on reflection. But what I remember is the snogging. I hope that’s not just a Yorkshire word. I don’t know if it’s in the OED, or if it will translate well, but it’s basically prolonged and passionate kissing, and something teenagers do so well. This is how ‘the tunnel’ looks now. I was prepared for the changes, as I’d read plans for the Museum Gardens which included trying to make more of this historically significant ruined remnant. It’s now filled with display boards, and the sarcophagi were moved elsewhere. I guess they might be the ones displayed at jaunty angles in the nearby flowerbeds. The teenagers of now still favour this area, but have moved around the corner. That’s a subject in itself and needs a new page perhaps. For now, it’s sufficient to record that for this teenager of the 80s this place has its own history, and is best summed up in six words, which I’ve got scribbled here on a bit of paper, as I thought they encapsulated what it is to be sixteen. And to live in a historic place, with history drawing you to certain places and spaces, where, it is hoped, you arrive without the emotional baggage of adulthood, and with no fear of death. We sat on sarcophagi and snogged. “We sat on sarcophagi and snogged” – that’s a brilliant first line, but now I want to read the rest of the poem! Perhaps someone nearly local like Tony Harrison or Simon Armitage would like to complete it – unless you already have! Have exhausted any poetic abilities with that one line of six words! totally agree with Andy about the brilliance of the line. For goodness sake give us a few more or pass it on to a local poet to complete please, please please. In an instant, my memory jogged. I felt again, my face go flush. I felt his embrace strong and warm. I could only succumb when in his arms. Surely he used his kit of charms. With his cuddles, his charm and kissing. How we were back on that day? Passion was such, my sense deranged. We shared but a night on sarcophagi and snogged. Is it only me whose memory jogged?